This is my assignment with the Secret Recipe Club.The aim of the club is that you are allocated a blog from which you have to select a recipe and try it and blog about it. My assigned blog was The Savvy Kitchen. I really enjoyed looking through Amy's blog and was very tempted to create some of the lovely cookie recipes she has on her blog. But since summer is here and we are all trying to loose weight I am trying to eat healthy so I finally settled for the ( Cilantro) Coriander Lime Rice. It was delicious.The only changes I made were that I used lemon instead of lime in the rice and added a green chilli to spice it up. 3. Heat oil in a pan, when its hot add the rice and stir fry for few minutes. Add the salt and 400 ml boiling water and bring the rice to boil, once the rice is boiling reduce heat to lowest setting , cover and simmer rice for 20 minutes. 4. After 20 minutes open the pan and with a fork fluff up the rice , stir in the chopped coriander, green chillies and lemon juice. Delicious and lovely looking coriender and lemon rice. Wonderfully prepared. Yes it would go well with veg thai green curry. This dish looks lovely and refreshing. I love rice but it always turns into a stodgy mess when I cook it. Louisa, for perfect rice use this ratio of rice to water 1:2 ie 1 cup rice add 2 cups water, its fool proof. Thankyou Joan, I love cooking and eating so I guess everything I post is things I love. I do love flavoured rice - coriander and lemon sounds lovely - and the bowl you've served it in is really cute too! Michelle, its pretty bowl I love it with its matching spoon. Michelle, yes I have been part of the secret recipe club for over two years now and I have tried so many recipes from new blogs and also made so many new friends through it. I love the colours of the lemon rice. Next time I make rice, I'll cook them using your recipe rather than making plain rice. Mina sometimes just simple recipes with few ingredients turn out the best. Yum, that sounds lovely - and very summery! Great recipe. I bet this rice will tastes fabulous when served along with rajma masala, looks wonderful. Oh never thought to make lemon rice..will have to give this a go! 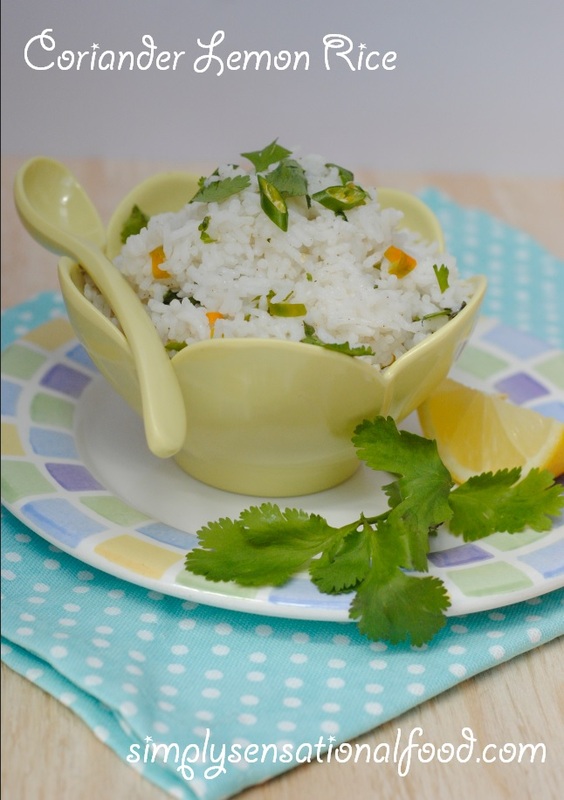 I so wish I enjoyed coriander, as the picture of that rice looks absolutely divine! Thanks for sharing. Yum yum yum! I really don't make enough of an effort with rice. 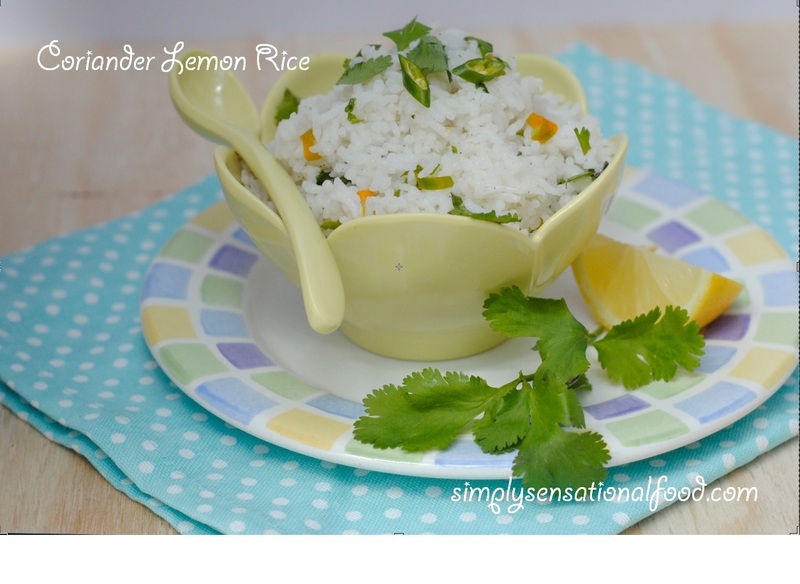 Coriander lemon rice looks yummy.. I love such simple one pot meals.. This rice sounds perfect, it would be a great side to many dishes. I adore citrus and coriander! delicious! i love rice with other flavours in it, but especially lemon. This looks delicious. Rice and lemon is such a refreshing combo. I love these combination of flavours together. Your pictures make it look even more delicious! YUM! I've made a version of this before and added in avocado - so delicious any time of year! I'm not a big coriander fan, but this does look great. You reminded me of my college days in chennai. lemon rice was one of the favorite dishes then! Will try your recipe soon...at home! You can also write a post on coconut rice. This sounds delicious and your photos are BEAUTIFUL!! Bet this would go great with some tacos or along with other fillings in a burrito! I love how you switched up this recipe! I love the Cilantro Lime Rice, but now I'm tempted to try your creation as well! Great pick!